Use the quick links below to jump to a particular section of our sights and activities coverage for Hanoi. Hoe Nhai Pagoda was a major Buddhist pagoda under the Ly Dynasty and today offers a serene retreat from the busy city at its gates. The dynasty ran from the 11th to 13th centuries, when it was set on a much larger plot of land. It was trimmed to its present more modest size when the French colonised Vietnam. One of the steles found here dates to the early 18th century, and allowed for ... Read more about Hoe Nhai Pagoda . Located in Ba Dinh Square right by the Ho Chi Minh Museum, the One Pillar Pagoda is one of the most recognisable symbols of ... Read more about One Pillar Pagoda . In the northern part of Hoan Kiem Lake, and accessed from the eastern side, sits Ngoc Son Pagoda, or Pagoda of the Jade Mountain, first used as a site of worship in the 14th century. ... Read more about Ngoc Son Temple . The tranquil and sprawling Temple of Literature was established in 1070 by Emperor Ly Thanh Tong, and became the site of Vietnam's first university, the Imperial Academy or Quoc Tu Giam, six years ... Read more about Temple of Literature . Tran Quoc Pagoda, the oldest pagoda in Hanoi, offers beautiful architecture, historic artifacts and a peaceful and serene ... Read more about Tran Quoc Pagoda . Pho Linh Tay Ho Pagoda in Hanoi’s Tay Ho district is a fine example of a Vietnamese pagoda, with both traditional Buddhist symbolism and Tibetan statues and ... Read more about Pho Linh Tay Ho Pagoda . One of the most popular and important places of worship in Hanoi, Tay Ho Temple trumps even Tran Quoc for its enviable lakeside ... Read more about Tay Ho Temple . Bach Ma or White Horse Temple is beautiful, well-maintained and bustling, serving as a good example of what small temples in Vietnam are all ... Read more about Bach Ma Temple . Chua Ba Da is an historic pagoda tucked away down an alley just near St Joseph's Cathedral. It's a touch difficult to find (we had to ask a security guard across the road to point it out), but look for the archway with Chua Ba Da written across the top on Nha Tho, the street leading down to St Jospeph's Cathedral. Wander down the alley and it opens into a wide, leafy courtyard, at the back of ... Read more about Ba Da Pagoda . While told from a clearly pro-government perspective, the Hanoi Police Museum showcases the interesting history of Hanoi's police force and offers some fascinating photographs and exhibits to ... Read more about Hanoi Police Museum . The Ho Chi Minh Museum does exactly what, given its name, you would expect it to do. Opened in 1990 on the anniversary of Ho Chi Minh's birth, the Soviet-style museum is a bizarre hagiography brought to life. ... Read more about Ho Chi Minh Museum . The Vietnam Military History Museum has a comprehensive collection of war relics charting Vietnam's struggle for liberation. If you're only going to see one war museum in Vietnam, this should be it. While the styles of the displays are definitely outdated by today's whizz-bang interactive exhibition standards, there is a lot of history packed into this museum that is still fascinating. The old ... Read more about Vietnam Military History Museum . Originally sprawling over 13 hectares, Hoa Lo Prison, better known as the Hanoi Hilton to Westerners in one of its later iterations, was one of the largest prisons built by the French in Indochina. ... Read more about Hoa Lo Prison (Hanoi Hilton) . The Vietnamese Women’s Museum is one of the best museums in Hanoi and is well worth a visit for anyone interested in the culture of Vietnam. It gives insight into Vietnam’s 54 ethnic groups, addressed through the lens of women’s ... Read more about Vietnamese Women's Museum . The Vietnam Museum of Ethnology is a little out of the way from Hanoi's main sights, but as one of the city's best and most informative museums, it's worth seeking out. If you're planning on going trekking to the north and northwest of Hanoi, this museum should really be considered essential, but it goes well beyond covering the groups who live ... Read more about Vietnam Museum of Ethnology . The National Museum of Vietnamese History is spread across two sites; Site One is set in a stunning colonial-era building and houses some simply beautiful historically important exhibits, while Site Two (on Tran Quang Khai), which was formerly known as the Vietnam Museum of Revolution, is less compelling, but still worth a spin through. ... Read more about National Museum of Vietnamese History . The Vietnam Fine Arts Museum has one of the best and most diverse art collections in the country, and a visit here will provide some good insight into Vietnamese culture and ... Read more about Vietnam Fine Arts Museum . Located about 15km outside Hanoi, this is often a stop along the way to the Perfume Pagoda. The two-storey museum has seven galleries dedicated to the system of trails collectively known as the Ho Chi Minh Trail. The trail stretched from northern Vietnam along the Laos border at a latitude parallel to Vinh along the coast (which was the main port for supplies destined for the trail), down to ... Read more about The Ho Chi Minh Trail Museum . A visit to Hanoi would be incomplete without a wander around Hoan Kiem Lake, the centrepiece of the city. No matter the time of day, the lake is surrounded by activity and points of ... Read more about Hoan Kiem Lake . Thong Nhat (or Reunification) Park is a great spot to relax with a book or enjoy a hassle-free stroll or jog. While you wouldn't come out of your way to visit as a tourist, if you're looking to do a spot of people-watching or running, it will do the trick very ... Read more about Thong Nhat Park . Also known as Ho Tay or Lake of Mist, West Lake covers a sizeable part of northwest Hanoi and offers an array of ... Read more about West Lake . Hanoi is home to the world's largest mosaic mural wall, which snakes just shy of four kilometres along the Red River dyke running north to south to the east of city's Old Quarter. ... Read more about Mosaic wall . Hanoi offers an array of art galleries, from commercial ones pumping out appealing art and copies for the masses through to higher-end spaces, where you might pick up an original $5,000 piece from one of Vietnam's in-demand ... Read more about Art galleries . If you love flowers, you'll love a poke around Hanoi's colourful and photogenic Quang Ba Flower Market, where masses of glorious flowers are bought and sold by the impossibly ... Read more about Quang Ba Flower Market . Chau Long Market is a great example of an everyday Hanoi wet market. Come early for the full experience, or a little later in the morning for a more relaxed ... Read more about Chau Long Market . It’s not top of any must-do list in travel guides, but a visit to Hanoi’s chaotic Long Bien market is a fascinating exposure to the life of a large proportion of Hanoi residents. But you’ll need to get up early — very ... Read more about Long Bien Market . Hanoi's oldest market Dong Xuan mainly sells bulk food items, clothing and accessories targeted towards locals in its three storeys of packed ... Read more about Dong Xuan market . For most people a holiday is a chance to escape from the gym — well, it certainly used to be for me — but for longer-term visitors who want to work off the bia hoi, or gym addicts, Hanoi offers a selection of gyms, both cheap and ... Read more about Gyms . Lacquer items — paintings, photo albums, bowls, vases — are a popular souvenir in Vietnam. Old Quarter in Hanoi is flooded with shops selling the same selection of items at the same — negotiable — prices. But why not make your own take-home piece of lacquerware? Here’s ... Read more about Lacquerware classes . The crazy streets and hectic traffic in Hanoi make it seem less than child-friendly, but the city offers many activities that children will enjoy. Here’s a selection of things to do with kids in the Vietnamese ... Read more about What to do with kids in Hanoi . When lotus flower season hits in June, the West Lake area becomes awash with the blooms, which hold particular significance in Vietnam, where they are considered one of four graceful plants, along with pine, bamboo and ... Read more about Lotus flowers . Ask any foreigner in Hanoi, particularly one who’s already tried to learn the language, and you’ll be told how difficult it is to master. Well, not just to master: even to speak more than a few ... Read more about Learning Vietnamese . Hotels with pools are certainly out of the budgetary reach of most visitors to Hanoi, and I definitely wouldn’t be jumping into the Red River or Hoan Kiem Lake, but fortunately a few public pools provide a reasonably priced alternative if you’re in need of a swim — quite possible now the weather has heated ... Read more about Swimming . Cua Bac Church was built in 1932 by the French and is one of the most important in Hanoi today for Catholics. Originally called Church of the Martyrs, the 700-capacity church was designed in a somewhat eclectic style by French architect Ernest Hebrard, featuring a bell tower on one side of the main building and various Art Deco touches though the roof tiles remain in Vietnamese style. In ... Read more about Cua Bac . The beautiful neo-Gothic St Joseph's Cathedral in downtown Hanoi was consecrated in 1886 and remains active today thanks to the city being home to a large community of local ... Read more about St Joseph's Cathedral . Hanoi offers cooking school options worthy of consideration so you can keep eating the delicious dishes you discovered on your trip here once ... Read more about Cooking courses . Hanoi is often, sadly, just somewhere visitors stop off for a night or two en route to Ha Long Bay, mountainous Sapa or a dash down the coast to Ho Chi Minh City. But for those who do want to take a look around, however fleeting, Hanoi can be a fascinating destination in its own right. So, if you just have one day in Hanoi, how do you make the most of ... Read more about One day in Hanoi . Most people travelling through Hanoi give the city a couple of days before heading to Halong Bay, Sapa or down to the centre and south of the country. Here are our suggestions for what to do on a tight budget if you have just two days here and want to make the most of ... Read more about Two days on a budget in Hanoi . We've written about how we'd spend two days on a budget in Hanoi, but what about if you have a little longer? Linger for four days to see a bit more of Vietnam's capital, and here's what we'd suggest you ... Read more about Four days in Hanoi . We’ve covered Hanoi on a tight budget, but what if you’ve got a few extra dong to rub together during your visit to the Vietnamese capital? If you want to mix some luxury in with your Hanoi exploring, here are some ... Read more about Hanoi on a splurge . I am writing this from a chair barely inside the doorway of The Cart - a small coffee and sandwich place in a narrow alley not far from St Joseph's Cathedral. My laptop tells me I have a choice of six different WiFi options courtesy of the surrounding hotels. My coffee, on this occasion, is Italian but during warmer seasons I'd choose the more ubiquitous iced Vietnamese ... Read more about Do nothing and see the best of Hanoi . Two or three days? Four or five? If you’re wondering how many days to spend in Hanoi, err on the generous side as there are plenty of ways to fill your time. Here’s our pick of some less common ways to spend that extra ... Read more about Stay another day . After four tours, approximately 13 kilometres of walking, three portions of banh cuon, a kilo of extra weight and enough sugar to dissolve a few dozen teeth, my food tour adventure in Hanoi is over. It's reinvigorated my love of street food and inspired me to try a few new places, but which was the ... Read more about Which is the best street food tour in Hanoi? . Continuing my exploration of street food tours in Hanoi, I booked onto an afternoon tour with Hanoi Street Food Tours, run by Mark Lowerson, of Sticky Rice fame, and Van Cong Tu, the “Vietnamese God“. Bring on three hours of snacking ... Read more about Hanoi Street Food Tours . With street food being such a defining feature of Hanoi, it’s no surprise that a variety of tours here explore the world of the 10-inch plastic stool. We’ve checked out a few of the options, starting with Hanoi Cooking Centre ... Read more about Hanoi Cooking Centre . Food on Foot, operated by Vietnam Awesome Travel, offers great tours with plenty of ... Read more about Food on Foot . The Hanoi Street Food by Night tour, offered by Urban Adventures, is perhaps better described as a walking tour of Old Quarter with some food stops thrown in -- not necessarily a bad ... Read more about Urban Adventures . As well as being a tasty and cheap dining option, eating street food provides a great opportunity for people watching and an insight into local ... Read more about Street food tours in Hanoi . If you’re interested in seeking a really good understanding of the heritage and culture of Vietnam while in Hanoi, check out Friends of Vietnam Heritage (FHV), a non-profit group that holds interesting events and publishes books on intriguing ... Read more about Friends of Vietnam Heritage (FHV) . What’s worth getting up for at 04:00 on a chilly Sunday morning in Hanoi? A sunrise photography tour of Long Bien market with Vietnam In Focus, that’s ... Read more about Hanoi photography tour . If you need a break from the chaos of Old Quarter, wander down to Hanoi’s French Quarter, where wide open streets, majestic buildings and high-end hotels, restaurants and shops ... Read more about The French Quarter . I recently attended a talk at The Bookworm entitled “Stories houses tell” and given by Linda Mazur, a Canadian who has been living in Hanoi since 1998. ... Read more about Walking tour of 1930s architecture in Hanoi . Truc Bach Lake lies about three kilometres to the northwest of Hoan Kiem Lake and is easily reachable on foot or by cyclo. ... Read more about A walk around Hanoi's Truc Bach lake . HanoiKids was set up in 2006 and is a student-run organisation offering free city tours in Hanoi. ... Read more about HanoiKids: City tours the fun way . Hanoi offers superb shopping, from interesting Vietnamese tourist trinkets (or tat, depending on your perspective) through to stunning, world-class art, and almost everything in between: think historic propaganda posters, water puppets, traditional musical instruments, hand-crafted quilts, Bat Trang’s famous ceramics, coffee filters as well as coffee … the list is long. Buy that extra baggage ... Read more about Shopping in Hanoi . The 36 streets of Hanoi’s Old Quarter spread over a small area, but just try spending time here without getting lost! Here's a rundown of some of the main streets and what you can find there. ... Read more about Hanoi's 36 streets . If you are planning a long roadtrip, or one that doesn’t start and end in Hanoi, it’s likely to be more economical to buy a motorbike rather than rent. Here’s a rundown of where to buy a secondhand bike in Hanoi. Do remember that if you don’t have a local license, your travel insurance may be invalid — do check ahead of your trip. Here’s a rundown of where to buy a secondhand bike in ... Read more about Buying a secondhand motorbike . The sprawling Perfume Pagoda, or Chua Huong, is a series of revered shrines and temples tucked into the pretty Huong Tich mountains, a few hours' drive out of ... Read more about Perfume Pagoda . With more than 400 boats to choose from, selecting a Ha Long Bay tour is tricky enough to start with. Throw in the third party travel agents and hotel tour desks – who can quote whatever they want for a cruise – and it’s a minefield. Here are some tips to get the best for your ... Read more about Booking a Ha Long Bay cruise . When planning your trip to Vietnam, it can be a challenge to fit everything in, and one of the questions you may well ask yourself is how long to spend in Ha Long Bay. While this is a personal choice, here’s our ... Read more about Two or three days in Ha Long Bay? . At 139 kilometres from Hanoi, Mai Chau is a popular two- or three-day trip from Hanoi. Having squeezed onto over-crowded, under air-conditioned buses on previous trips, on our latest soujourn we decided to jump on motorbikes and cruise there at our own pace, wind in our hair, sun on our backs and all that. Was it worth it? Yes. Is it for everyone? No. Here’s ... Read more about Hanoi to Mai Chau by motorbike . Home to the pottery families of Hanoi, Bat Trang village is also referred to as the ceramic village and makes for an easy half-day excursion from the city. It's one of numerous old villages on the outskirts of the capital that have specialised in a range of cottage industries for ... Read more about Bat Trang ceramic village . While not a must-visit destination, if you’re not in a rush and are keen to explore less touristy spots in Vietnam, Tam Dao hill station is worth an overnight from Hanoi, especially to escape the capital’s summer heat. Here’s some advice on how to spend your time ... Read more about An overnight trip to Tam Dao . After my enjoyable visit to Bamboo Village (Bang So) I was really looking forward to the trip to Vermicelli Village (Cu Da); I love food and am always keen to learn more about ... Read more about Cu Da, or Vermicelli Village . Son Tinh campsite, 40km from Hanoi’s centre (but still technically in Hanoi), provides a peaceful retreat from the capital’s maddening crowds. ... Read more about Son Tinh campsite . There has been a motorbike-supply eruption in Hanoi in recent years, with numerous operators offering not only bike rental and sales but also organised tours. Here's the ... Read more about Motorbike trips . Dau pagoda, considered Vietnam’s oldest, is located 24 kilometres south of the centre of Hanoi, in Bac Ninh province, and takes about one hour to reach by ... Read more about Dau pagoda and Horn village . In the past, villagers in Vietnam tended to specialise in making particular items to meet their needs, sharing their skills with neighbours and relatives. This led to individual villages becoming known for a particular handicraft. As people moved to the cities they gravitated towards others with the same trade and hence we have areas such as Hanoi’s Old Quarter, where different streets ... Read more about Bang So (Bamboo village) . Motorcycling from Ha Giang offers arguably the best scenery in Vietnam or even Southeast Asia, and provides the opportunity to explore a stunning region as yet relatively untouched by ... Read more about Motorcycling around Ha Giang . As well as bike tours, Cuong’s Motorbike Adventures offers a range of tours by US Army Jeep to destinations within and outside Hanoi such as Mai Chau and Duong Lam village. While slightly on the pricey side, they are an unusual and fun option if you want to set your own agenda for a tour of Hanoi or are keen to explore further ... Read more about Jeep tour . You don’t always have to stick to the tourist trail in Vietnam; simply striking out somewhere for the hell of it can be richly rewarding. Bac Kan province is little visited by tourists, although its main point of interest, Ba Be Lake, attracts those looking for natural beauty outside of Ha Long ... Read more about Exploring Bac Kan province . If you haven't had a good mountainside pagoda experience, these two spots (with confusingly similar names) are some of the oldest and most historically important pagodas in Vietnam, reachable via an easy daytrip. The first of the two, Chua Thay or 'Master's Pagoda', is about 19km from Hanoi. Just head southwest out of Hanoi on Duong Lang-Hoa Lac, take a right turn, go under the new flyover, ... Read more about Thay and Tay Phuong Pagodas . 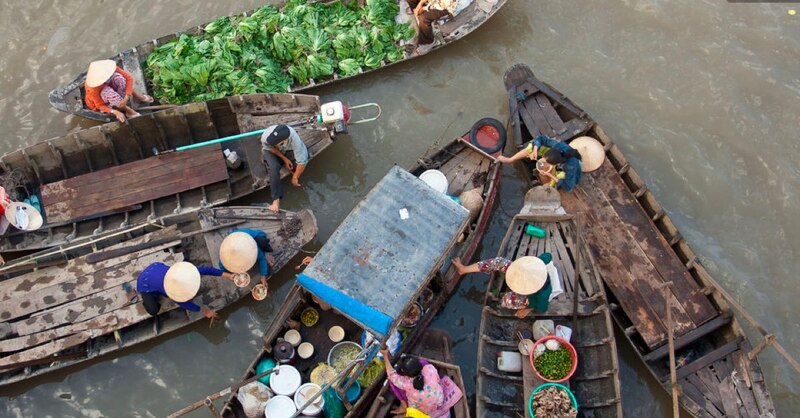 This is the easiest of the Hanoi daytrips, about 16km outside the city. The main draw here is that it's one of the oldest structures still extant from Vietnamese history (though Cham and Sa Huynh culture is much older). The ancient, spiral-shaped citadel dates back to the third century BC, with a few of the ancient ramparts remaining but hard to spot among the more recent construction. There's ... Read more about Co Loa Citadel . If you're planning to visit only one national park in Vietnam, other parks, like Bach Ma near Hue, should be higher up on your list than Ba Vi. Nevertheless, it's a beautiful park and if you just want a quiet getaway for a day or so, it's a fine choice. The main attraction at the park is the mountain itself, which rises to more than 1,200m above sea level. There's a very good road leading 12km ... Read more about Ba Vi National Park . Thang Long Water Puppet Theatre is the place to go to experience a traditional Vietnamese water puppet ... Read more about Thang Long Water Puppets . Massages in Hanoi range from very cheap and cheerful foot massages through to high-end luxury spas, where you’ll pay nearly $100 for just an hour of pampering. The choice can be overwhelming but here’s a selection of places we think are worth checking ... Read more about Where can I get a good massage in Hanoi? . Humanitarian Services for Children of Vietnam (HSCV) was founded in 2002 to help orphans, homeless children and other children living in poverty in Hanoi and surrounding areas through the provision of food, shelter, clothing, health and ... Read more about Humanitarian Services for Children of Vietnam . Dating back to the 19th century, this special house is a great example of the type of architecture that once prevailed throughout Hanoi's busy Old Quarter. ... Read more about Heritage house at 87 Ma May St . The Hanoi Opera House, located in the French Quarter, is an attraction in itself. Do try to catch a show here so you can experience the building in all its ... Read more about Hanoi Opera House . With 360-degree views over Hanoi from 65 storeys up, the Lotte Centre Observation Deck is where you'll get a real sense of how huge the city has ... Read more about Lotte Tower Observation Deck . In that great communist tradition, the liberator of Vietnam Ho Chi Minh remains lying in state so his admirers can pay their respects, even nearly five decades after his ... Read more about Ho Chi Minh's Mausoleum . A visit to the exterior of the Presidential Palace, plus a house Ho Chi Minh lived in from 1954 to 1958, then his so-called House on Stilts, and his car collection, naturally follows a stop at nearby Ho Chi Minh's ... Read more about Presidential Palace and Ho Chi Minh's House on Stilts . The Chuong Duong Bridge opened in 1985, and is one of the main bridges that moves traffic across the Red River in Hanoi. The four-lane, steel span bridge's claim to fame is that it was the first sizeable bridge designed and built by Vietnamese workers, with no international assistance. Located just south of Long Bien Bridge, and beginning near the Old Quarter, it took almost two years to ... Read more about Chuong Duong Bridge . The sprawling grounds of the World Heritage-listed Thang Long Citadel are a palimpsest across which Hanoi's history has been written and re-written. You can easily spend a few hours here exploring the grounds and the archaeological dig just across the ... Read more about Thang Long Citadel . Impressive Long Bien Bridge, which spans Hanoi's Red River to connect Hoan Kiem and Long Bien districts, was built by the French colonists at the turn of the 20th ... Read more about Long Bien Bridge .